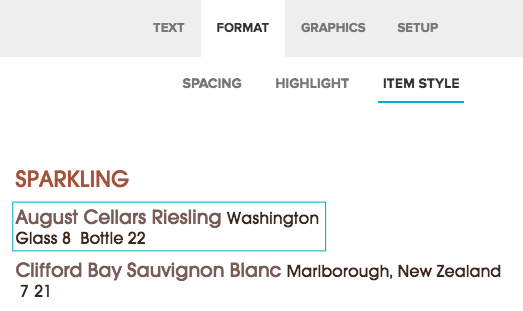 Use multi-price columns to display recurring sizes as commonly seen on pizza menus and wine lists. 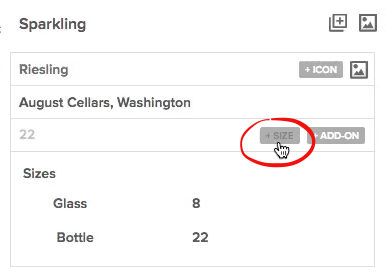 Start in the Text tab to add your first wine section. Give the section a name such as "Sparkling" in the example above. Enter your first item and description. Click + Size to add size names and prices as shown below. After the item appears on the menu preview, select the item name, click the Format tab, then Item Style as shown below. Style options will appear on the left including Multi-Price Styles. You can choose to set up column pricing with the price after the item name, or opt to show the item name, description and price on the same line.